Not so long ago, I used to go out and buy my daily loaf from St John and walk home again, and the only person I knew in Spitalfields to speak to was Sandra Esqulant, the landlady of the Golden Heart. Just six months later, all that has changed entirely, now I cannot walk anywhere here in Spitalfields without meeting someone I know! My life has been transformed. For several years, I nursed my mother Valerie at home through the Dementia that afflicted her. It was an isolated existence, caring for her, feeding her and reading her stories until eventually she died. Throughout these years, I lived constantly in the presence of death. At almost any point in the final two years, she might have died. Whenever I came upon her sleeping deeply (as I did most days when I came to feed her), there was always a moment when I had to ask myself if she had died and I would observe her breathing to confirm whether she lived, before I woke her. Years later, it has become apparent that this experience has filled me with the compulsion to write about life. By “life”, I mean all the aspects of existence you see in the categories on the right hand side of this page. In particular, my passion is to explore human life through examining the different qualities of people. I want to use my writing to draw me closer to life. When I began to write Spitalfields Life, I had no idea where it would lead. For over a year, I had been sending pictures daily to my friends from my phone and so it was a natural progress to transfer this process to the internet. But at the moment of commencement, in envoking the name of Spitalfields, I recognised a responsibility to undertake the project with the greatest of care, endowing it with a dignity that reflects my affection for this corner of London. Though equally, I am personally vividly aware that “life” is no less an operative word in the title for me. Kierkegaard compared the experience of being a writer to that of constantly running through a burning house snatching whatever can be rescued. I think this describes something of my feeling, as I walk through the streets here, because I have this drive to record all the stories of the people and the place, as many as I can, at the rate of one a day, before I meet my own demise. Spitalfields has always been in flux, on account of its position at the boundary of the City of London and so it is in the nature of this place that it is always changing. My pursuit is to record as much as possible, especially the experiences of the people here, in midst of this constant transformation and reconfiguration, as it happens. Once I began to write posts, something wonderful happened. People began to read them, more and more people. It was an extraordinarily uplifting experience to discover that there was an appetite for my stories of Spitalfields and it confirmed what I had always hoped, that if you strive to do something to the best of your abilities, people will seek it out. All the generous responses I have received from you, my readers, have touched my heart, filled me with humility and given me confidence too – inspiring me to raise the bar, trying to write better and better stories to delight and intrigue you. And you have obviously been talking to your friends, because each week there has been an increase, as more have come to read. Above all, I cannot disappoint you. The presence of you reading has inspired me with courage to go out and talk to people, seeking stories to write – and the outcome of this is that I have met so many diverse people here in Spitalfields and each one of these people has become fascinating to me in a different way. It has enriched my life far more than I ever expected. I have learnt so much and Spitalfields has become even more intriguing to me. I count my own good luck to live somewhere with an exceptionally long and interesting history, inhabited by a phenomenal range of people. The more I learn, the more I want to know, and every person I meet suggests someone else for me to talk to. And so it goes on. Over the last harsh winter (in what was previously always the most dejected season for me), there has been this rising chord as the stories have become more compelling and the readership has grown too. At first, I assumed the role of a journalist undertaking an interview but almost immediately this boundary dissolved – because everyone I met treated me with unexpected kindness and because these are the people who inhabit the place I live. Many of the subjects of these interviews have become friends and so what began as a project entitled Spitalfields Life has quite simply become my life. Transforming my life, it has made me look at people differently as I grow to understand their motives better and the result is that the city has become a more human place for me. I owe it all to you. All this happened because you came along. I sacrificed my career to be a full-time nurse for my mother, then afterwards I could not go back, but Spitalfields Life has permitted me a new direction. Now, because of you, I find myself in this situation where I shall be writing to you every day for the next twenty seven years and I cannot think of a more beautiful way to spend the rest of my life. The gentle author loves the gentle reader. You are my Spitalfields valentine. The splendid Valentine at the top is the work of Rob Ryan and I am grateful to him for permitting me to reproduce it here. If you are reading this on Sunday morning, Valentine’s Day, there is still time to go to Ryantown in Columbia Rd and get one for your beloved. The picture below is my mother Valerie aged seven, taken by my grandfather Leslie. Your words, the lovely photo of your mother and Rob Ryan’s art: the most perfect valentine! Thank you so much. Wonderful. Bravo! Happy Valentine’s Day! What a lovely thing to wake up to. Thank you. Thank you so much. Your writing, your pictures and all that they communicate so vividly enrich my life. Each morning after my early morning walk across the fell behind my cottage I sit down to my computer with a cup of coffee and open the latest installment. After leaving behind my market stall in Spitalfields and moving from the East end to the north of England five years ago, I hadn’t realised how much I missed this magical area of London. Spitalfields life is my absolute favourite blog and now many of my friends also! Gentle author, I am a daily visitor, you keep me connected to my hometown when I am on the the other side of the world and through you I explore in a way I never thought possible. I thank you for your beautiful writing and pictures and for an insight into your life past and present. Its truly an honour. By walking out of your house each day and writing so beautifully about the lives of those around you, you enrich our lives and also make theirs live in history in away which has hardly been possible before the internet. When I first read this this morning I couldn’t quite work out what it reminded me of – both in tone and because of the photo. After a couple of hours it struck – those beautiful Stephen Poliakoff plays – ‘Shooting the Past’ and Perfect Strangers’. Thankyou, once again, for your words. I am one of your regular readers. I return every day to read more about your adventures in Spitalfields. I discovered your site after my own lovely visit to Spitalfields, a place where I used to go regularly before I moved away. I miss it very much and love being able to see a glimpse of it everyday. Thank you for writing. Thank you gentle author ~ your Spitalfields valentine is very moving and honest, and what great photos! Happy Valentine’s Day from a new reader! Your curiosity about the world around you, compassion for the people that you meet and affection for the streets of Spitalfields are an inspiration to me. I thank you for the pleasure that your writing gives me every day. I loved this post, it caught up so many of my own threads and set them down in a better order. I was reminded of these words by Georges Perec which I learned recently: “To write: to try meticulously to retain something, to cause something to survive; to wrest a few precise scraps from the void as it grows, to leave a furrow, a trace, a mark or a few signs.” It has been nice to hear a little of your story today, too… although I know how that can make one feel vulnerable… so thank you. I love my daily read as do the many others that visit this blog. You have entranced us all with your stories and pictures of your life in Spitalfields. It was by chance that I came upon you and how glad I am that I did. I didn’t know that much about the area before but was and still am hungry to know more. Spitalfields, i’m sure , must be proud to have such a person in its midst who cares about it and its people. Your blog is my all-time favourite. What a gift you are giving us. Your words will live on and become a treasure long after we are all gone. Please consider publishing your wonderful work in a book, maybe annually? There are many easy-to-use self publishing websites (like blurb.com or lulu.com). Thank you dear gentle author for this wonderful journey that you permit us to take with you. What a lovely blog sent out to all of us who are captivated by your daily discoveries and musings, we are even more intrigued!…. 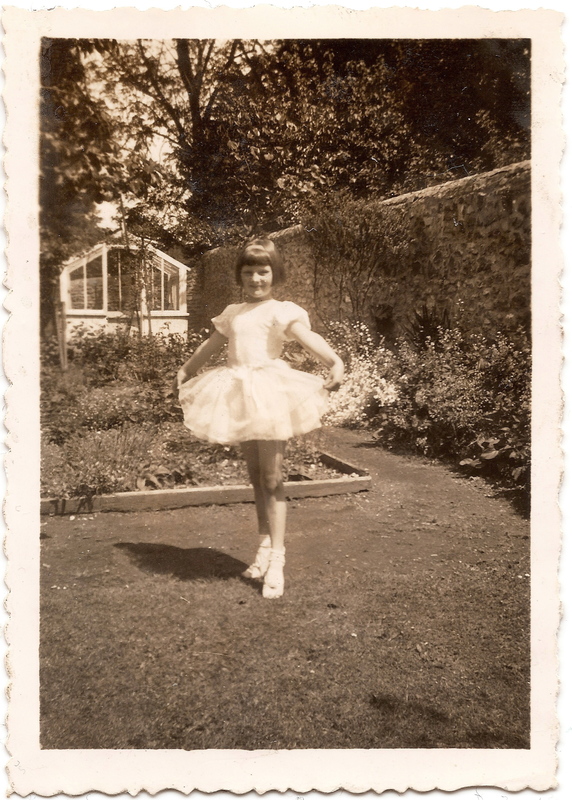 and how nice of you to share the lovely photo of your mother looking so sweet and happy in her ballerina dress in a lovely walled garden. She looks like Milly Molly Mandy! (one of my favourite storybook characters when I was about 7). You cannot know how far your words travel. Even for those who do not live in the UK, the stories are interesting, heart warming and real. However, in sharing your personal story of renewed life, you have given us inspiration and hope. Thank you for thinking of your gentle readers on this Valentine’s Day. It has been over ten years since I visited London. I miss it every day. Your blog is a daily gift to this western Oregon Anglomaniac. I was feeling a bit glum that my boss was not sending me to England to manage an event I planned that will take place in Cambridge. But then you wrote such a lovely Valentine, and it reminded that you send a slice of England every single day to me and all of your readers. So thank you, and a Happy Valentine’s day to you, Gentle Author. PS My daughter proudly carries to school her suede pencil bag with bunnies that I ordered from Jill Green — as a slightly extravagant but worth it Christmas present — after seeing her leather work and prints featured on your site. I only wish I could shop at more of the merchants you feature. It’s every day an enrichment to visit your blog … not only for my English. You inspire me to see my own surrounding with new eyes. What a thoughtful gesture from a thoughtful author. We read you because you are so good! Hi, gentle author. While I live in the U.S. (Washington, D.C. to be exact), I just love reading your blog. London is my favorite place in the world, and I always look forward to going back as we do usually every year. Your blog has given me a fresh look at a part of the city that we’ve never really ventured into. We’ll be there in April and look forward to exploring the Spitalfields area. Thank you so much! Lovely piece, gentle author – could you provide a reference for 5he Kierkegaard quote?